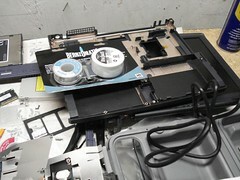 This is a shot of my workbench after disassembling the Vaio laptop. This laptop was not meant to be taken apart based on my experience. I have ordered a new power connector and will solder it back to the motherboard. Next up I reassemble it and see if it will turn on.